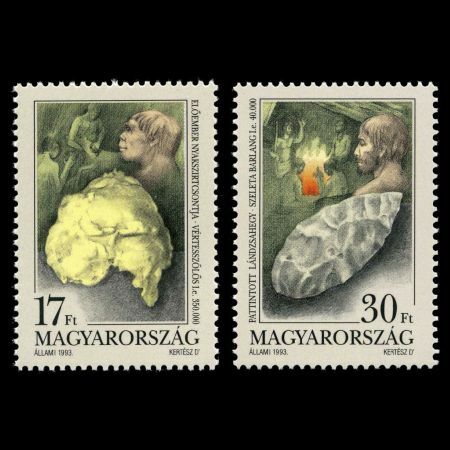 Hungary 1993 "Finds of prehistoric settlemens"
On October 27, 1993 Post authority of Hungary issued a set of two stamps dedicated to some founds of prehistoric humans in the country. 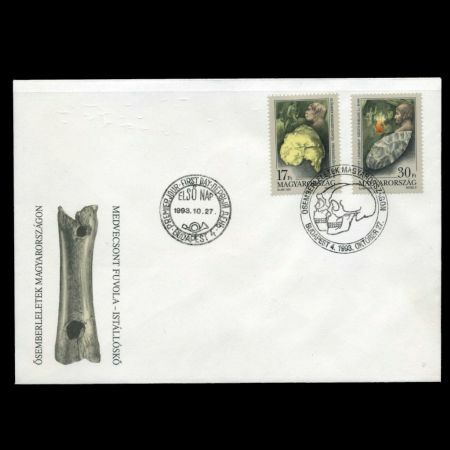 The stamp of 17 F depicted reconstruction of Homo erectus (Samu) and skull roof found at Vertesszolos, Hungary. "Samu" is the nickname given to a prehistoric man whose remains were found in 1965 near Vertesszolos, Hungary. He was a late Homo erectus, somewhere between Homo erectus and Homo sapiens. Only a part of the occipital bone was found. He lived about 350,000 years ago. The archaeological site was discovered by Marton Pecsi in 1962; the occipital bone was found three years later during a dig led by Laszlo Vertes. Since it was found on August 21, the name day of Samuel, it was named Samu (Hungarian version of Sam). Two child teeth were also found. Samu was able to use stone tools and fire. Replica of the remains can be viewed in the local Vertesszolos Museum. Original fossils are on show in the Hungarian National Museum in Budapest More info on Wikipedia. 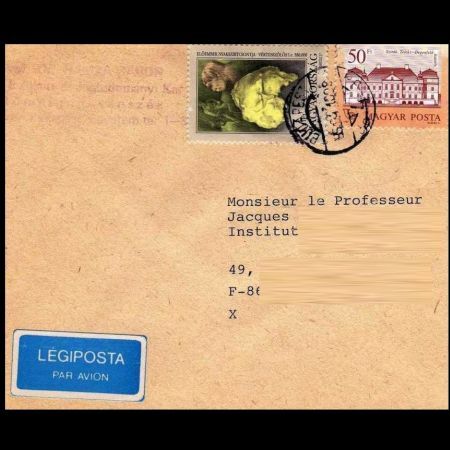 Hungarian National Museum on stamp from 1954, issued in set of 3 values "5 years of Constitution". The stamp of 30 F depicted reconstruction of prehistoric man, probably Cro Magnon and stone tool found at cave Szeleta, Hungary. In the hillside above Miskolc-Felsohamor, the Seleta Cave was explored by Ottokar Kadic between 1907 and 1913 at the instigation of Otto Herman who launched research into prehistoric man in Hungary. In the cave entrance not only were many cave bear bones found but even traces of a fireplace. As the excavations continued fragments of pots and Neolithic stone tools came to light, while the earlier layers hid a total of 40 Paleolithic stone tools. Today under strict protection, the cave evolved through the dissolving effect of a once plentiful karst spring that has since dried out. The passages are over 90 metres long in all. The cave is a temporary and permanent home to numerous endangered animal species, including both protected and strictly protected bat species. The protected cave is not developed. It can be visited at any time.